Das Informationsportal mit Info Blog und Online Ratgeber von info2info.de - Infos und Ratgeber kostenlos und verständlich - einfach informiert. Infos und Ratgeber kostenlos und verständlich – einfach informiert. Amazon Prime – Beitrag hat sich erhöht – kündigen? Amazon Prime – Beitrag hat sich erhöht – kündigen? Und wenn ja, wie? Die Mitgliedschaft bei Amazon Prime ist an sich eine nette Sache. Für einen Jahresbeitrag von 29.- Euro erhält man jede Bestellung – die direkt von Amazon versendet wird – versandkostenfrei. Und dies meist auch schon am nächsten Tag. Zusätzlich kann man viele, jedoch natürlich nicht alle, Amazon Kindle Bücher kostenlos ausleihen. Was hat sich jetzt geändert ? Zunächst einmal steigt der Jahresbeitrag der Amazon Prime Mitgliedschaft von 29.- auf 49.- Euro im Jahr. Here you got some Info how to replace your LCD Display if the backlight gets dimm and dark. You wont need to replace the old EL-Backlight foil anymore, if you take a modern display with LED Backlight. The LCD Display Replacement instructions her works for Synthesizer KORG, Yamaha, Kurzweil, Kawai, Akai MPC. Kurzweil K2500 / K2600 may work too, not tested. In the linklist you will see what LCD types are needed. It is recommend not to unsolder and re-use the old connector Kit, but to purchase new sets. He will ship international, fast and very well packed. wich allow perfect clone of actual connection. The LED Backlight is very long lasting and not much more expensive than simple EL-Foil replacement. It needs 5 Volt DC Power for the LED-Backlight, which is common and hasslefree, some different displays need only 3,5 Volt and you have to add som resistors. But here you can use e.g. 5Volts of Floppy Disk Power of your Synth and have no Problem with calculating resistors. as linked here. Thean you will see what addition connectors and cable you will need for YOUR synth. Disclaimer: Modding and soldering at your own risk, I can not be held responsible for any damage! As you know: Unplug the device first – HIGH VOLTAGE inside! but I recommend to purchase a new one. there are different types, with small head connectors or big ones you can plug in. Which ones depends on how much space is behind the display, and as mentioned below on some models you need right angled connectors. Please look carefully how your old connector cable is build. See ordering example from ebay for IDC 20 Connectors and cables in the links( seller Just-Honest) below. When soldering IDC to Display on some synths you have to leave 21+22 pins open (see details in the links)! 21+22 are only anode and cathode (+/-) for the LED Backlight. solder your custom socket with simple Pin Headers (from ebay , for example). the backlight with 5 Volt. !!!!!! !DO NOT: DO NOT feed the LED backlight of the new display with the power for the EL-Light Foil of the old Display!!!! This is high voltage(! ), coming from a small transformator or „Inverter“ which converts low voltage (often 5Volts) to high power. if this is 5 Volts DC. 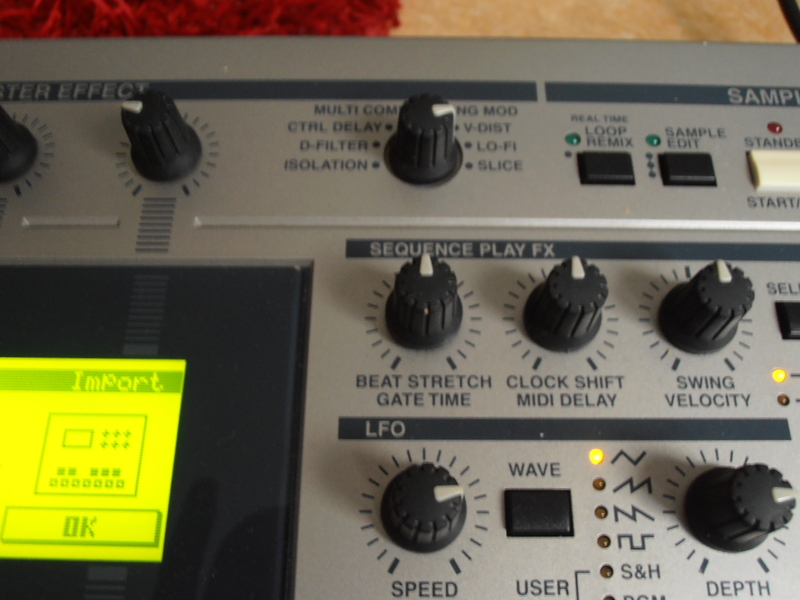 Note: On some synths you can easy get + 5 Volts from the source that powers the Floppy Drive. The transformator for the EL-Foil Power is now obsolete, and it often was the reason for that whining display noise. Need Connector with left-out pins? Just search ebay for „IDC20 PCB“, or „Pin Header“ if you want to build your own socket. Connection on your Synth is from the side? Look after this in ebay „20 way right angled header connector“. Some links for installation of the display- if one isnt working or you find newer, please mail me in the comments – Thank you! but you will change the whole display, BUT: Here you may find some usefull hints how to open and re-assembling your device. It´s never a bad idea to take photos when disassembling, also easyier when looking for similar parts (theconnectors) on ebay. You may need to reinstall your OS to format the new Display. with a 20 pin right angled pcb header connector, see pictures in the links or on ebay or google. This one is especially for SY99, but most steps of the SY77 are identical, so you should read them too. 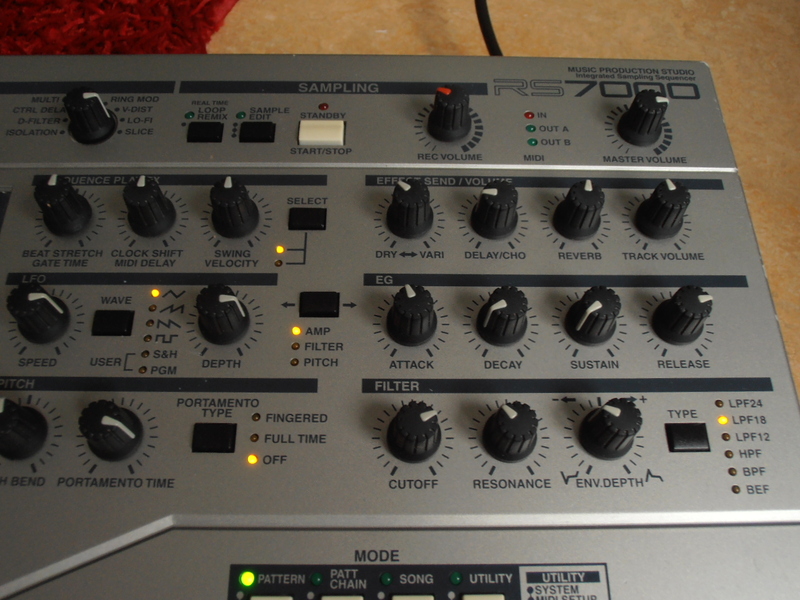 Last year I got a Yamaha RS7000 Music Production Studio with very weak knobs – some encoders and most of them are pots /potentiometers. The repair of the knobs of a Yamaha RS 7000 is a very difficult thing and hard work, you have to dis-assemble the whole machine from the bottom to the front, pulling the PCB´s carefully out and than de- and re- solder the pots or encoders. By the way, finding knob replacements is very hard too, you have to do some deep web search to find equivalent replacemnt potentiometers and encoders. How do the knobs / pots /potentiometers live longer? There is one simple hint I could not find in the manual so far, maybe its very hidden. So you can just „fly“ through the values with warp speed, without turning too much. Big thanks for this very usefull list of hints and tricks go to Phil Clendennin, aka „The Bad Mister“. Phil is a Yamaha professional. [SHIFT]+[UTILITY] to see available sequencer/sampler memory. Autoload: Hold TRACK button 1…9, on power up to activate Autoloads 1-9. You create the auto loads by, literally, naming the file “autold1”, “autold2”, “autold3”, etc. Once executed the unit will automatically load the file every time, until you reprogram it to look elsewhere. Holding track 10 on power up will cancel any programmed auto load. You can also place an auto load file on a SCSI drive. This makes it easy to pick up where you left off if you ever have to stop mid-session. Simply create an Autoload file in a folder named for the project in question, power up and you are back where you left off. You will naturally develop your own favorite drum sounds. The RS7000 will let you assemble and manage your own custom kits. Custom kits will be made from user samples and can be best assembled in a SAMPLE COMMON Program location. Individual samples that have been created in a Sample Local Program can be copied to a Sample Common program. The advantage is that Common programs can be accessed from all Patterns and Songs – not just the one they were sampled into. There are several ways in which you can get samples into a Sample Common Program: As mentioned they can be copied. Sample locations are number 001 through 128 and C001 through C128, where C is Common. Samples can also be imported directly into Sample Common programs (if you select the location in the mixer prior to importing). Even samples that have been Sliced into segments can individually be copied to a location within a Common Program Kit. The Sample Common Program can be named and stored as part of an ALL, a PATTERN or a SONG data file (.R2A, .R2P, or .R2S) and it can be loaded separately if you select LOAD, then select the “SMPL” as your load type and look in the “Common_Samples” folder. The RS automatically keeps track of “Common_Samples”, “Pattern_Samples” and “Song_Samples” and lets you extract individual samples from within ALL, PATTERN, and/or SONG data files types. When a Pattern or Song has a phrase that points to a Sample Common Program – the RS will automatically associate the samples used with the Pattern they are used in. This way if you load the Pattern – you will load the samples. The best way to archive your data is in ALL data files – because it is the most complete. It also lets you recover any portion of the data, for example, you can load a single Pattern from an ALL data file that contains 64 Patterns. You can load a single Song from an All data file that contains 20 Songs. You can recall any Local Sample (sample used within a Pattern or Song) or any Common Sample program from an ALL data file. Rather than save each Pattern individually to SmartMedia card – save an ALL file – this way it will not duplicate the COMMON samples for each individual Pattern save. Vielschreiber am PC und Programmierer haben in Bezug auf die richtige PC Tastatur oft die gleichen Ansprüche. Der Autor dieser Zeilen selbst hat schon zig Tastaturen unter den Fingern gehabt, und ist nach langer Suche endlich fündig geworden. die Tasten sollten durch Laser beschriftet sein, bzw lasergraviert. Das bedeutet, daß die Beschriftung der Tasten nicht durch irgendwelche Folien beklebt ist, welche sich dann gerne lösen oder abrubbeln, oder einfach nur bedruckt sein – die Farbe geht garantiert auch bald ab, sondern die Beschriftung ist per Laser eingraviert. Nutzt sich also nie ab. Mal ehrlich, die meisten nutz man eh nicht, also nur das nötigste wie Laut-Leise-Stumm und evtl. noch Email und Browser. Eine Taste für den bequemen Standby-Modus für die Kaffepause, oder den Ruhezustand. Sollte aber so platziert sein, um gegen versehentliches Auslösen geschützt zu sein. Welche Funktion diese Schlaf-taste auslöst, kann man bequem in Windows in den Energie-Einstellungen in der Systemsteuerung festlegen. 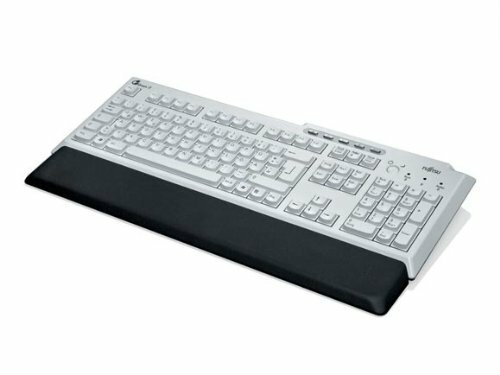 Welche Tastatur ist nun die Beste (meiner Meinung nach)? Diese gibt es als Fujitsu KBPC PX ECO oder auch als Fujitsu Siemens KBPC PX. Nicht viel, denn bei dem ECO Modell spart man nicht etwa Strom (würde sich bei einer Tastatur auch kaum lohnen), sondern das ECO Modell bsteht einfach nur zu 40% aus Recycling-Kunststoff. Mehr nicht. Ich habe beide Versionen getestet, sie sind komplett identisch, allerdings finde ich die Verarbeitung des „alten“ Modells ohne „ECO“ noch eine Spur wertiger. Die Optimale Tastatur nur für Programmier und zum Schreiben? Nein, auch Gamer oder „Zocker“ sind durchaus nicht anspruchslos in der Hardware Ihrer Wahl. Witzigerweise geht bei dieser Gruppe der Trend auch weg von sogenannten „Gaming“-Tastaturen – hin zu hochwertigen Standard Tastaturen. Einige Extrem-Zocker schwören immer noch angeblich auf eine uralte IBM-Tastatur. Auch diese Gruppe wird auf jeden Fall mit der Fujitsu KBPC PX ECO oder Fujitsu Siemens KBPC PX glücklich! Es werden 2 Anschlusskabel mitgeliefert – 1x PS/2 und 1x USB! Einfach das gewünschte Kabel hinten einclipsen. Die Tastatur hat an extra Tasten „Home“ für den Browser, Email, lauter/leiser und stumm, diese funktionieren allerdings nur beim Betrieb über USB. Sehr schön ist die versenkt angebrachte Taste für den Ruhemodus! Ebenso mitgeliefert wird eine ansteckbare Handballenauflage. diese ist nicht etwa eine Billig-beigabe sondern Qualität von Logitech! Qualität hat ihren Preis, die Fujitsu KBPC PX oder die bis auf das fragwürdige „ECO“ baugleiche Fujitsu Siemens KBPC PX liegen zwischen 40€ bis 80€. Teilweise werden hier die Tastaturen relativ günstig angeboten, aber man weiß nie ob man auch das richtige Tastaturlayout bekommt. Ich selbst hatte dort eine Tastatur mit dem Zusatz QWERTZ – deutsches Layout – DE bestellt, bekommen habe ich eine mit tschechischem Layout! DHL Parcel Service with Jason Mask. This Hockey Mask is well known from the Movie „Friday the 13th“ and worn by Jason Voorhees.